I’ve been re-reading various sections of the book by Peter Senge, The Fifth Discipline, lately and thought I’d share a few of my favourite passages so far. The truth is that I’ve not actually read the book all the way through, from cover to cover, before. Yet it has always had a place on my bookshelf and is the most dog-eared book I own. I tend to take it down and read a chapter here and there when I’m curious about something, or want to delve further into an issue that’s present in my mind. This time around, that issue is starting my exciting new role and Peter Senge has plenty to offer where that is involved. The book ‘s contention is that there are better ways to work together in organisations than the ways we’ve previously believed. The book is not new (it was published in 1990) but it still offers tremendous value to people trying to think they’re way through a better way of operating within their organisation. Specifically, the Fifth Discipline itself is the ability to use systems thinking to create better outcomes by aiming to become a learning organisation. The book goes into detail on the various techniques, mental models and ideas that can be used to encourage a culture of learning within the organisation. 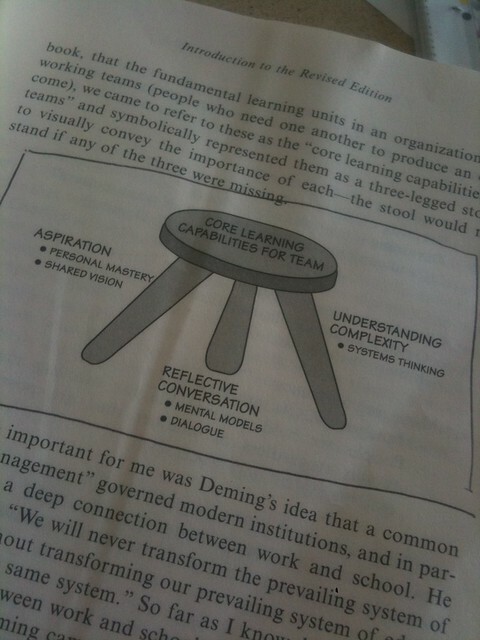 The photo you see below is the main framework used in the book, the core learning capabilities for (a) team. “To practice a discipline is to be a life long learner. You never arrive; you spend your life mastering disciplines. You can never say “We are a learning organisation,” any more than you can say, “I am an enlightened person.” The more you learn, the more acutely aware you become of your ignorance. Thus, a corporation cannot be “excellent” in the sense of having arrived at a permanent excellence; it is always in the state of practising the disciplines of learning, of getting better or worse.” – Pg 10. And so, The Fifth Discipline provides a useful roadmap to think about the culture that you’re trying to create in an organisation and the places where you can provide the most beneficial impact. It has a high degree of interdependence built into it. Many times, you’ll see organisations focus on one of the disciplines in such a way as to over-compensate, leaving the other disciplines under invested in. This is where you can get dissonance within a collective, where there appears to be a large gap between what is an espoused value and what is an experienced value. Dr W. Edwards Demming, known largely as the grandfather of Total Quality Management, had this to say about management theory, and why The Fifth Discipline is an important book. So, I’m going to keep sharing various thoughts and parts of the book as I review it, here on the blog. If you’ve read the book yourself, I’d love to hear your thoughts and ideas about it and what you’ve taken from it in the comments below, or email me at steve@thesquigglyline.com. Great value in what you put in your post Steve. Applying this discipline to our lives as a whole and checking in with where we are at time to time would be a valuable exercise. Thanks for the response Luke. How do you apply the disciplines above consistently? I’m curious about how to apply some of these ideas in practice. Looking forward to your ongoing musing about the 5th Discipline. It’d be great to here how your thinking emerges w.r.t. how it applies to Yammer and the new role you’ve taken on as well! Any advice on integrating the lessons within to your everyday work?